Casey is very easy to work with. She is confident in her abilities but puts her client’s vision first. With the first mood board she made for me, she nailed it and I wanted everything she suggested. That’s how well she knew my style and what I wanted. Since hiring her for my bathroom remodel, I’ve asked her to remodel another bathroom as well as my kitchen and dining room. I would highly recommend Casey for her ideas, her personality, and her confidence. Thanks Jenn! 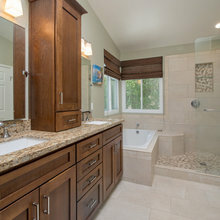 Can't wait to get started on our other projects and share how amazing your bathroom came out! 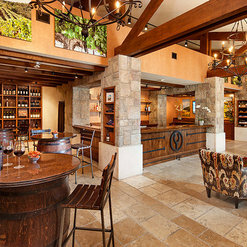 We can't say enough about working with Casey of Borden Interiors. We hired her for the renovation of our condo Kitchen back in September 2018. Right from the start Casey was organized, creative, helpful ( with making design and scale decisions) and so much fun to work with. She had estimated our project would take 3 months and cost $50.000. I have to say working with Casey and her contractors and sub contractors was the biggest relief through this process because it made our timeline completely seamless. Each and every subcontractor was detailed oriented and the quality of there work shows in the outcome of our beautiful kitchen. 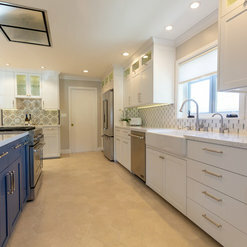 Borden Interiors works with the BEST of the BEST! Our project was completed on time and on budget which my husband and I appreciated very much. I can say I thoroughly enjoyed the renovation process because of Casey and I'm sad it's over, but I can't wait to do our bathrooms next year with Borden Interiors!!!! Thank you again Casey for everything and making my kitchen dreams come true. Thanks for that nice review Kali! I had so much fun working with you and also look forward to more projects! I hired Borden interiors to remodel my front guest bathroom. Debra and Casey were spot on with selections of tile etc and I went with their first selections. They were very quick and responsive to any questions I had. My bathroom turned out very beautiful and I wouldn’t change a thing. Thank you Christine for the nice review! We enjoyed working with you very much! Keep us in mind for future projects! 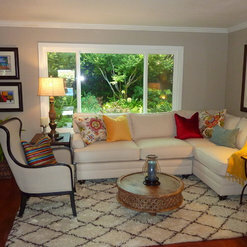 It has been a pleasure working with Debby, completely redoing two guest rooms and casita. Her professionalism and creativity is amazing. She listens and stays on top of every aspect. Thanks Diana for the nice review. It has been great working with you as well and look forward to our continued relationship! Deb and Casey are phenomenal when it comes to pulling a house together and making any room pop. I have used them for window treatments, finding that perfect piece of art, basic support to hang pictures and help place furniture. They work with you and bring an honest and refreshing perspective to decorating. And, they know who to bring in for jobs around the house. We are building a beautiful trellis and they found just the right guy for the job and saved me over $20K. Highly recommend Borden Interiors! Thank you Susan for the wonderful review! We love working with you too and can't wait to see the new trellis!! Excellent job! Very professional! Debbie Borden and her assistant, Casey Geeb were of great help to us finishing our year long remodel. We will continue to work with them on future projects! I hired Casey from Borden Interiors to help me with furnishings, paint, and window treatments. She had great ideas and was very helpful through the whole process. 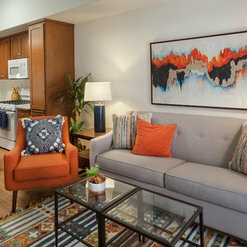 Casey created a unique style for my home and stayed within my budget. I am extremely happy with the finished product and will definitely use Borden Interiors in the future. Personality plus! The team helped me choose fabrics, offering several good options, but not confusing me! Once choices had been made, the team was efficient, the service on schedule, and any alterations necessary were quick and accommodating. Beautiful workmanship done on the drapes! A great design team to work with! 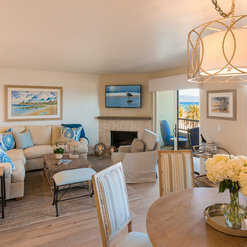 Debra helped us design and decorate 3 completely different spaces - our primary residence, a vacation ranch home in wine country, and a business office. In all three cases she was professional, organized, creative, and a good listener. Debra quickly understood our needs and tastes as well as our budget on all three projects. She was efficient. And helped enormously in the decision making process. We couldn't recommend her and her team more strongly! 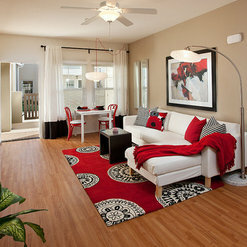 We have worked with Borden Interiors on 9 Homes! 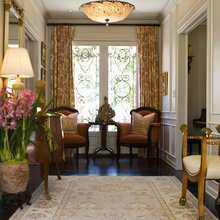 Debra and Casey not only have impeccable taste, the clients love them. 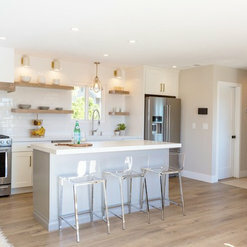 The hands on approach they take to every project allows for open and frequent communication so the difficult task of matching the desired finish product and budget becomes attainable! If you are looking for a firm that puts an emphasis on service and quality then we highly recommend using Borden interiors! 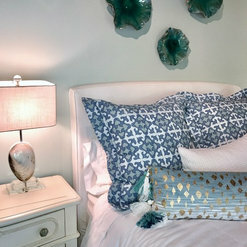 Commented: Where can I find these blue nightstands?Thank you for your interest! These nightstands are from Redford House (Trade only) please let us know if we can help you with anything further. 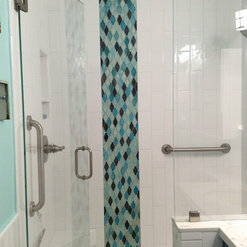 Commented: blue shower accent tileThank you for your question. 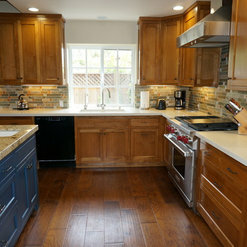 The tile is from a company called Lunada Tile, it can be purchased from Buena Tile in Santa Barbara. Hope that helps! Commented: who makes the bedside tableThank you for your question. The bedside table is from Redford House. Let us know if there is anything else we can help you with. Commented: I love the dining set! Can you tell me who makes it?Thanks for your comment! We LOVE this piece too! We actually had it custom made for our client. Please let us know if we can help! Commented: I love the lamp. Where can it be purchased?THANKS- we love the lamps too! We purchased them for our client through Currey and Co trade only- we are happy to help! 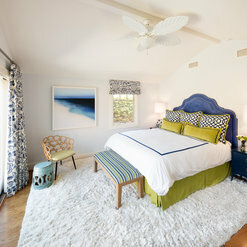 Commented: Accent Wall-Love the colorthe accent color is by Glidden- Green Lane! enjoy! !